sprinkle generously with salt. Place into the oven for 30 minutes . Chop the pumpkin into 2 – 2.5 cm dice and place into the roasting tray with the pork. Baste with oil from the roasting tray. Reduce oven temperature to 180°C and place tray back into the oven. Continue to cook for a further 40- 50 minutes, basting regularly until pork is golden and crackling crispy. Place the chicken stock in a small to medium saucepan and bring to the boil. Continue to boil until reduced by half. Remove pork from oven and rest, covered on a separate plate. Drain fat from pan, being careful to retain pork juices. Place baking tray on medium heat on the stove and add the wine, stirring with a wooden spoon to loosen pan drippings. Add the stock, and boil for 3-5 mins, or until thickened slightly. Add the chestnuts to warm slightly. Bring a small pot of water to the boil. Cook beans for 2 – 3 mins, or until cooked. 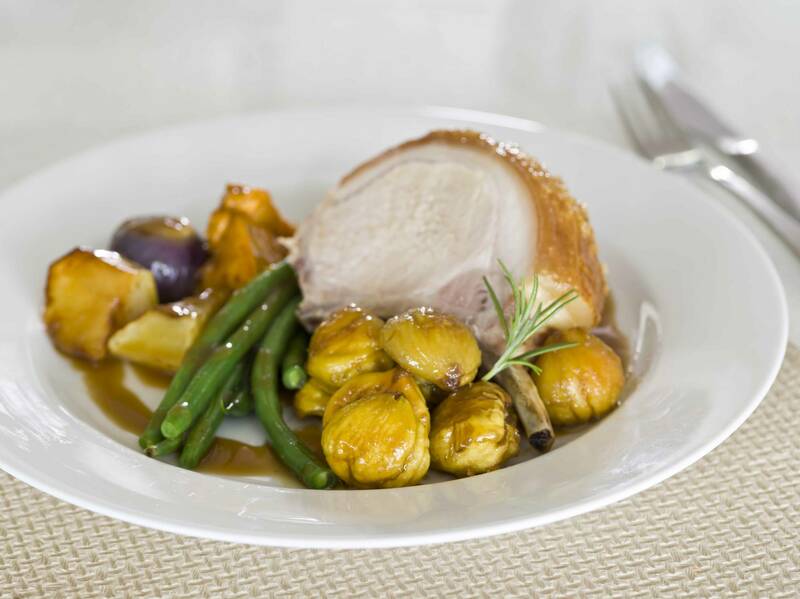 Meanwhile slice the pork and serve with the crackling, chestnuts vegetables and gravy.